Irritable bowel syndrome is a gastrointestinal disorder characterized by any one or all of the following recurring symptoms: constipation, diarrhea, gas, bloating, cramping, or abdominal pain. The cause of irritable bowel syndrome is unknown and thought to be related to changes in the sensitivity of nerves and rate of contractions of the intestines as a result of genetics, gastrointestinal infection, food intolerance, and psychological factors such as stress, anxiety, and depression. What foods may worsen IBS symptoms? There is no single nutrition plan that will work for everyone with irritable bowel syndrome. As Jill learned, keeping a food record for a few weeks of her intake and digestive symptoms started to show a few patterns and a few foods that proved to be problematic. Specific foods do not cause irritable bowel syndrome but the most common foods cited in research that may increase symptoms include fatty foods (such as high-fat snack foods, heavy restaurant meals, fried foods, cream sauces and fatty meats), cauliflower, broccoli, cabbage, brussels sprouts, cabbage, onions, garlic, legumes, whole grains, eggs, nuts, and seeds. Limiting the quantity of high-fat foods eaten at one time as well as eating more of your veggies cooked instead of raw may improve irritable bowel symptoms. Consider an over-the-counter alpha-galactosidase supplement such as Beano to prevent gas that can help break down complex starch found in legumes, vegetables and grains. Also be aware alcohol, MSG (monosodium glutamate), caffeine, carbonated beverages, and chewing gum may be problematic for some people with irritable bowel syndrome. Inulin fibre supplements and inulin added to some breads, pastas, crackers, cookies, and yogurts can cause gas and other symptoms. Sorbitol, mannitol and xylitol are types of sugar alcohols added to low-calorie candy, diet products, and sugar-free sweeteners can cause gas and diarrhea so should be avoided. Large quantities of fructose (the natural sugar in fruit, juice ,and honey) can aggravate irritable bowel syndrome symptoms so be mindful of portions consumed at one time. A large percentage of people have a lactose intolerance that hinders their ability to break down lactose (the carbohydrate part of dairy foods such as milk, yogurt and ice cream). If you suspect dairy foods or other foods such as wheat are a problem for you, ask your doctor to screen you for lactose intolerance and celiac disease before unnecessarily removing these foods from your diet. What foods may improve IBS symptoms? Firstly, remember that drinking enough fluids is very important for normal healthy digestion. Be sure to drink two to three litres of water or other fluids each day. Plant based foods such as grains, vegetables, and fruit contain a mix of both insoluble and soluble fibre both needed for health and digestion. 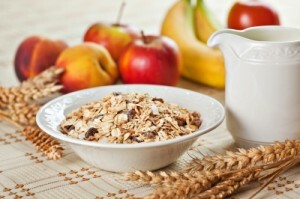 If you have irritable bowel syndrome, try increasing soluble fibre in particular. Soluble fibre forms a gel and slows digestion and is found in foods such as breakfast cereal containing psyllium, oatbran, oatmeal, barley, avocado, asparagus, oranges, and pears. While beans, lentils, and chickpeas contain a high level of soluble fibre these foods are also gas producing so these would need to be tested to see if they are helpful or harmful for your symptoms. When using canned legumes, drain and rinse the liquid they are packed in to help reduce gas. Probiotics: Friendly live bacteria such as bifidobacterium, lactobacillus and acidophilus that live in the gut can help with IBS symptoms and overall health. Probiotics are available in supplements or found naturally in yogurts advertising they contain live bacteria culture. Psyllium: Psyllium supplements (also found in Metamucil) are a rich source of soluble fibre shown to relieve constipation and improve symptoms such as diarrhea and abdominal pain. Some research shows relief is sometimes not seen for four weeks after starting psyllium supplementation. Peppermint Oil: Several studies show that taking peppermint oil can reduce abdominal pain, distension, gas, and bowel movements in those with irritable bowel syndrome. Your gut likes routine. You may find the more consistent the type, time, and quantity of your food intake, the better. Other consistent lifestyle patterns such as getting enough sleep and quiet time to relax and relieve stress are also key. Regular physical activity is a great stress reliever and can help stimulate bowel movements. Also, providing a regular, non-rushed time each day to go to the bathroom may sound simple but can be a game-changer in managing irritable bowel syndrome. Jill found that as much as she hated getting up earlier each day, being less rushed before work ensured she could relax and have a bowel movement. Days this was skipped; inevitably she experienced gas, bloating, and difficulty going to the bathroom later that day. Great article, thanks. I have found a number of my IBS clients end up having wheat sensitivity, but not gluten sensitivity / celiac. Often this is accompanied with skin rashes or rocacea, as well as gut reactions. It seems to be more prevalent now than 10 years ago. Thank you for writing this artice. It is very informative and packed with great information that is helpful. In addition to the very helpful suggestions, I would add to the treatment of IBS the use of ginger. My preferred format is to actually chew on the fresh ginger root ( it burns like h…!) but it works instantaneously for reducing gas, bloating and abdominal cramping and discomfort. I use it as I can’t digest a lot of beans/legumes and certain grains as well as dairy. My family also use ginger for the same reasons. Hi Phyllis! Thanks for this great tip that others may also want to try. All the best and thanks so much for sharing!